All our life we study, we grow, we learn, we get a job, we earn and in the midst of all this, we forget to live. Amidst the chaotic urban life, Chetan Soni’s debut book comes are a refresher. He is one of the few who understands the difference between sarcasm and verbal irony. Coupling wit with humour, the author presents us with 60 pages of a light dose of entertainment. The book is a collection of lines that brim with slapstick humour. Ironically these lines also throw light on various truths of life that we all are ignorant to. 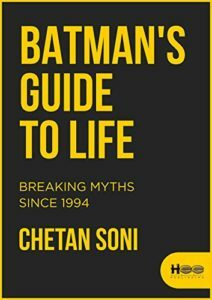 Witty and acerbic, ‘Batman’s Guide to Life’ might be harsh for some and amusing for the majority. Though the book is only 60 pages long, the inclusion of Kabir and Sonia’s love story seemed needless. More one-liners could have done justice to the title of the book. There are no significant errors but owing to my habit, I couldn’t turn a blind eye to the verbs that did not agree with the subject. Nevertheless, the book is a quick read and a joyride too!